Stan Laurel and Oliver Hardy, a couple of up-and-coming comedians on TV, are back in Hollywood from France, where they made a movie (they make movies, too). 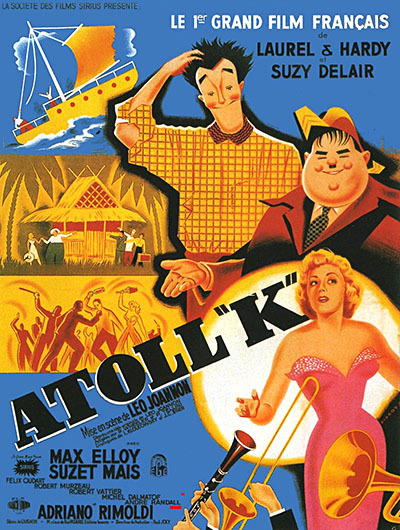 The French picture is called “Atoll K,” and with its release in the fall Stan and Ollie should regain their rightful place in the cinematic scheme of things. “So we quit,” nodded Laurel. “Like Vivian Blaine, in ‘Jitterbugs,’” Stan volunteered. The script of “Atoll K” was, I gathered, something of an international affair, and making of the film in France wasn’t all smooth sailing. It was the first foreign movie for the boys, and before long they were broadcasting frantic long-distance calls for help. Tim Whelan, Hollywood director, responded—“but never got started”—and Monty Collins rushed over to supply some badly needed gags when production resumed after Laurel underwent a serious operation last January. The French director, one Johanon or Johannon, first name Leo, was also, it appeared, the “creator;” and he never let anyone forget it. Although “Atoll K” was a sea-island story, he spent three days shooting a lake because it was photogenic, according to Hardy. “He was doing a travelogue,” Laurel interposed, with a shy grin. “He wore riding breeches and a pith helmet and carried a megaphone” said Hardy. The company was an Italian-French English outfit. Laurel and Hardy spoke English; the rest of the cast-including Suzy Delair, “one of the biggest feminine draws in France”—spoke French. Their, voices will he dubbed in the version for America. “It’s partly fantasy,” he added helpfully. “In the old two-reelers, we spent the whole picture trying to accomplish just one thing—moving a piano, climbing into an upper berth and so on,” Ollie said. Laurel and Hardy are enjoying the same vogue in Europe today on the screen that they are in American TV. “Our Relations,” one oldie, is in its sixth month in Germany, and “Fra Diavolo” another (from 1933) is having its 10th revival in Italy. 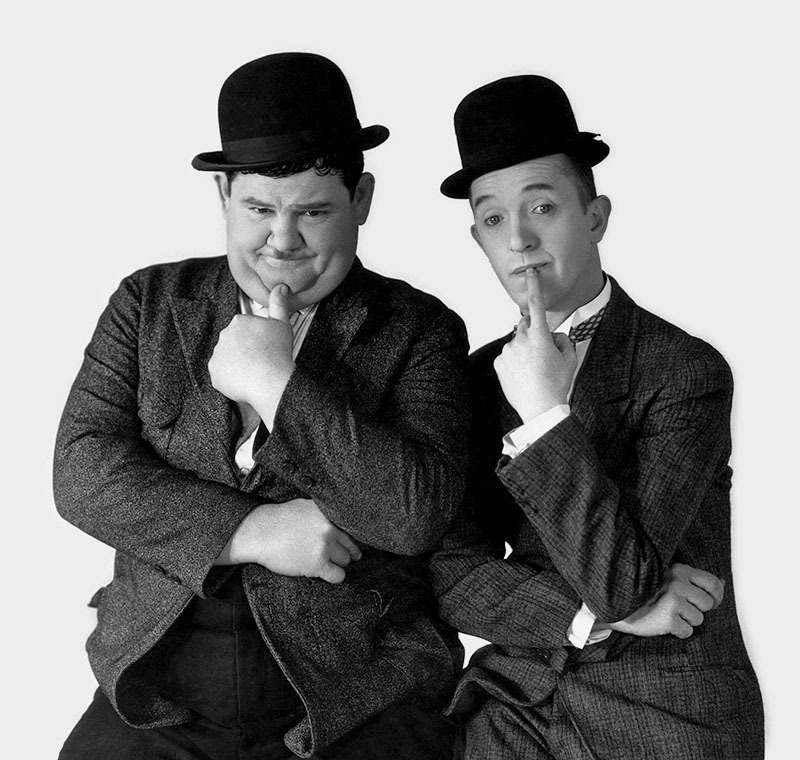 Both comedians are married and live in modest Southland homes—Stan Laurel in Santa Monica and Oliver Hardy in Van Nuys. Hardy, known to his friends as Babe, is, at 59, double-chinned, baldish and 6 feet 1 inch, wears shell glasses and a trace of familiar mustache. He has lost some weight, he says, so that now he can tie his shoelace without puffing. Stan adds that he could stand some of Babe’s weight! Like the mouse in the shaggy-dog story, Stan’s been sick. “There’s a bug,” he explains, “but they don’t know its name.” He is 61 and “not as ready or able to go” as he once was. But his pale blue eyes are still full of fun. Meanwhile, offers are piling up for this unique and beloved team—offers for TV series, for an Italian stage revue, a Japanese cinema; for their life story in a Billy Wilder movie. Hollywood or no Hollywood, the world is not likely to let this Silver anniversary pass unnoticed.